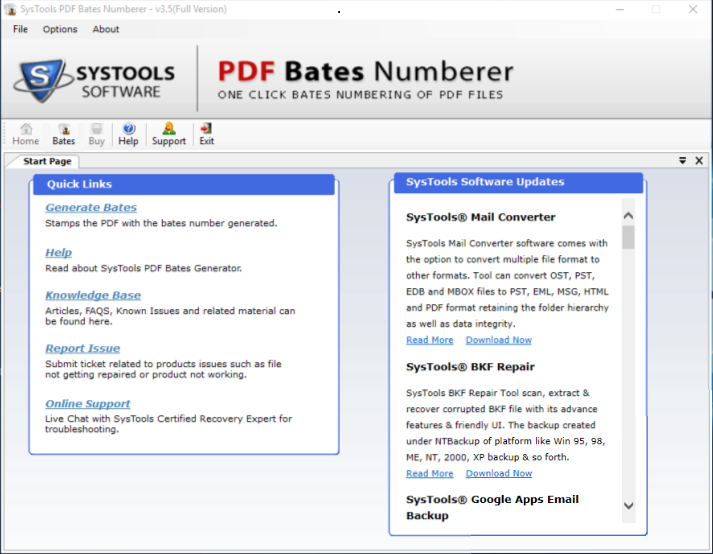 Looking for a Better Tool to Add Bates Number, Header and Footer in Adobe PDF files? The page numbering tool allows you to add page numbering in PDF documents in different ways. 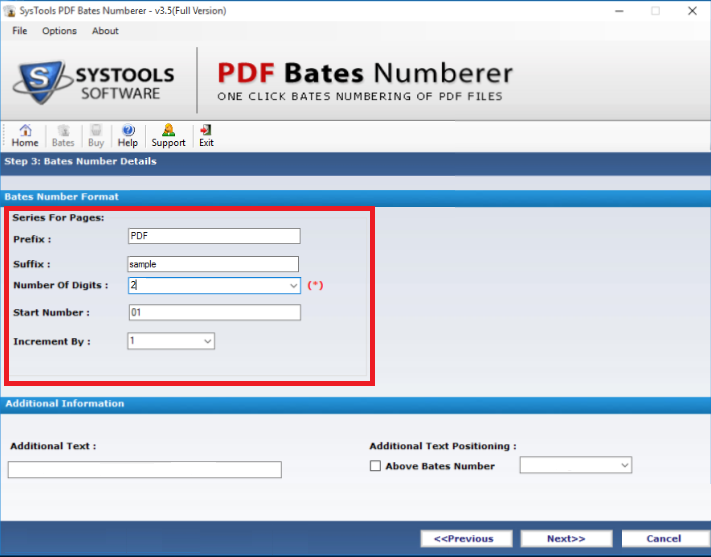 You can perform Bates numbering of multiple PDF files altogether in batch. The software provides an option to add files or folder having multiple files. There is also a "Move UP" & "Move Down" option which allows you to arrange the order of PDF files. Additional Text: Allows the user to add some confidential text in each file page. Additional Text Positioning: Allows setting a position the additional text on Top Right, Top left, Bottom Right, or on the Bottom left of the PDF. According to Original File Name: The output PDF file can be saved with its original name itself. According to Bates Number: You can save the file with first Bates number, selected while creating the Bates Number. The software offers an option to set font size & the font color of the Bates number of your choice. With the help of this option you can insert bates numbers in PDF prominently on every page. The user gets a complete report of all the preferences and options he/she has selected like: color, font size, Bates number position, etc. It shows a complete report of the PDF files that you selected, along with a preview of them. 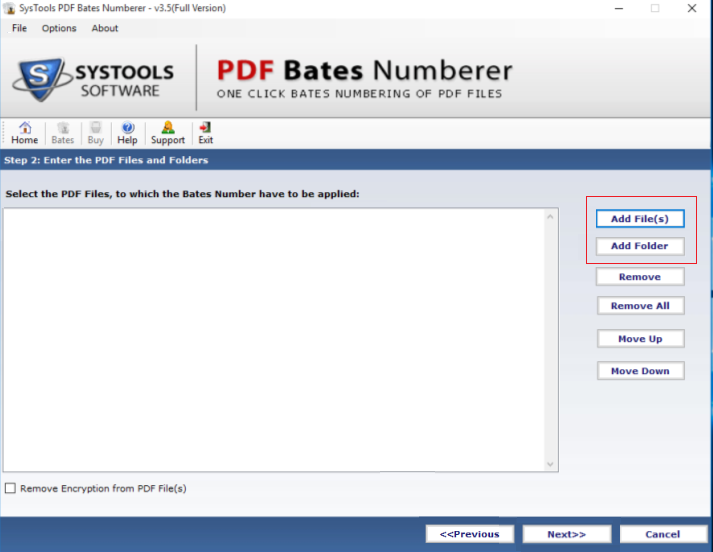 The PDF bates Numbering application is built with advanced algorithms. Thus, it generates a complete summary of all the settings selected for numbering the PDF file(s). This report is generated before as well as after bates numbering PDF with details like; selected option, preview of numbering, number of PDF files, bates number format, confidential text and its position, number of pages (if applicable), etc. 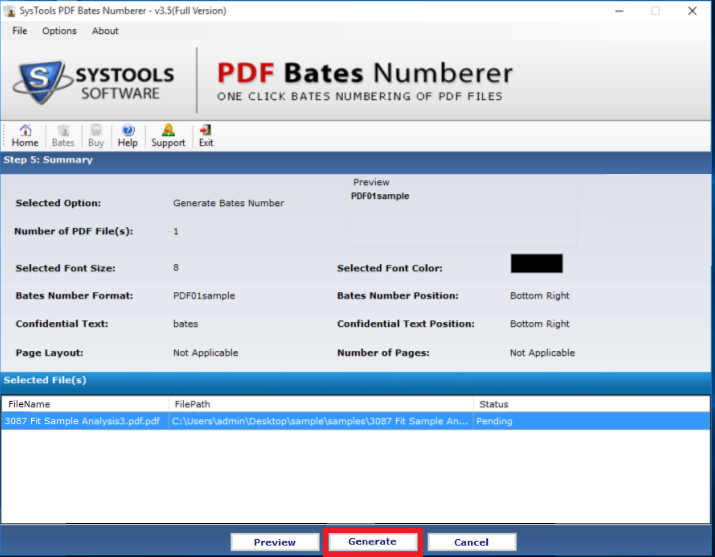 The Demo Version of PDF Bates Numberer software is free and it helps adding Page Number to PDF. You can download this trial version online. Demo Version allows Bates stamping of the PDF documents but will add the company’s name as a watermark to all the files. If you want to stamp all your PDF files with Bates numbers but without the watermark, then you have to go for the purchase of the Licensed Version of our product. Purchases can be made online through PayPal. However, it is not important to create a new PayPal account in order to purchase the batch PDF bates Numberer tool. Is this software compatible with Windows 8 environment? Yes, the software is compatible with Windows 8.1, Windows 8 and all below versions too. Can I stamp Bates Numbering in multiple PDF files in batch? Yes, you can use this software for numbering multiple PDF files also. You can either add multiple PDF files or an entire folder of PDF files to the software. Can I use this software on a machine configured with Mac OS? No, PDF Bates Numberer is only compatible with the Windows operating System. How can I use this product for forensic purpose? 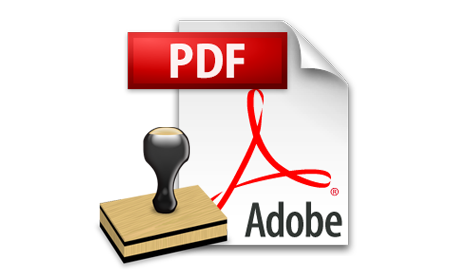 PDF Bates Numberer creates a series of number for each PDF file, and its pages; according to the suitability. If any unauthorized action is performed on these files, you can find out those changes by checking the series of Bates Number on each page. Does the software affect the contents of the PDF files? No, the software does not alter any content or properties of the PDF file while processing it. It just places the required Bates number on/within PDF files. Can this software be used to add a disclaimer at the end of each page of my PDF file? Yes, you can use this software to add a disclaimer or any other additional text on each page of your PDF file. You can also set the position of this additional text on the page accordingly. We recently purchased the PDF Bates Numbering software and are satisfied with the product. It gives us the option for Bates number positioning. It saves a lot of time. The Bates Numbering tool is a great program and met all the stamping requirements of our company. It not only allowed numbering PDF file pages, but also allowed to add a prefix or suffix to number PDF files and allowed to mark each page with stamps such as "CONFIDENTIAL". There were a number of PDF documents that had to be presented in a legal proceeding with the details of case evidence. Thanks to the PDF Bates Numbering, I arranged each document with its pages set in a specific order. A large collection of PDF files was difficult to handle. One day while extracting some crucial information for a case history, one of my friend’s suggested using this tool. I used it and got my PDF files managed properly.